See an actual barracks from the Heart Mountain Internment camps. Experience Nakahama Manjiro's daunting shipwreck adventure through his written accounts. Get a taste of Hawaii at the Kona Coffee story exhibit. These exhibits and many more make up a fascinating visual record of 130 years of Japanese American History presented by the JANM, located in an atmospheric section of Little Tokyo. The JANM's core exhibit is entitled "Common Ground: The Heart of the Community". 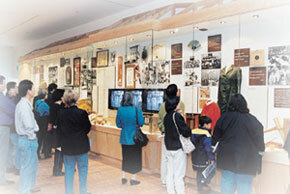 Constantly updated, it presents the history of Japanese Americans from 1876 to today. Generations of personal histories reveal how Americans of Japanese ancestry resettled, forged their identity, and contributed to the redefinition of this country. The JANM's Museum store also offers uniue gifts like beautiful Okasane earrings or a Japanese music doll or a classic shibuya vintage fan. A collection of Japanese music is also available at their Museum Store Online (janmstore.com). Purchases are a fun way to help fund JANM's exhibits and operation. The JANM's big annual fundraiser is a spectaclar dinner at the posh Century Plaza Hotel and Spa. This year JANM will recognize the key role that Japanese Americans have played in American progress by celebrating over 70 Japanese American family businesses. JANM was founded in Los Angeles, California in 1985 by community members with the aim of improving appreciation for America's ethnic and cultural diversity by integrating the Japanese American experience into our nation's heritage. It was initially located in the former Nishi Hongwanji Buddhist Temple before moving to its current location. For more info or to contribute, go to http://janm.org. You are someone's one in 30,000, according to AADP's chairman, Jonathan Leong. "If you are someone's match in a minority group, you are probably their only hope" Leong says. 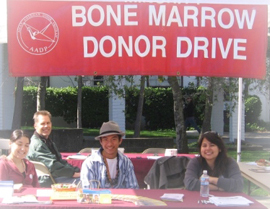 The Asian American Donor Program recruits blood and bone marrow donors from the Asian community, increasing donor matches for other Asian Americans suffering from life-threatening blood diseases. Every year, the AADP raises awareness with its annual gala, FantAsia. featuring Asian performing artists, a dinner prepared by top Bay Area chefs, silent auctions, and more. When two leukemia patients were unable to find a match within their own families or among the scarce 123 Asian donors in the National Registry, their family and friends successfully recruited over 2,000 Asians in California to the National Registry, but with no success in finding a match. The deaths of these two people gave birth to the Asian American Donor Program, dedicated to saving lives in the Asian community. The Asian American Donor Program is a non-profit organization that addresses the desperate need for Asian, Pacific Islander, and Multi-racial blood and marrow donors through recruitment and awareness. For more information on how to contribute, go to http://aadp.org.